Wonderfully Atmospheric and Well Crafted Songs. 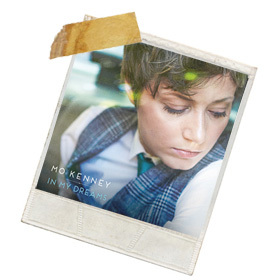 Billed as a singer-songwriter Canadian Mo Kenney’s album In My Dreams sounds a lot more like a band effort; although one with a helluva lead singer. Even a hardened old cynic like me got caught in Mo’s headlights when I first heard the bitter-sweet I Faked It which opens the album. An excellent arrangement and Kenney’s deceptively innocent voice masks a very clever song indeed. Those who know me and my reviews know that I ‘collect lyrics;’ not writing them down you understand, but sometimes a line or a couplet stands out and must be quoted; again and again and again; especially if they are humorous. The opening couple of lines from Take Me Outside go straight onto that list! Wow! That certainly got my attention. The song is an absolute cracker too. It’s proving very difficult to pigeon-hole Mo Kinney for you as she sounds a bit like a Bangles/Ryan Adams mash-up with a Phil Spector influenced feedback drenched/bass overload throughout. But, of course she sounds nothing like that at all. A couple of songs have already gone onto playlists for car journeys. The echo and organ enhanced Untouchable is on the one for when my wife isn’t there. The one with Leonard Cohen, Lou Reed, Dr John, Scott Walker etc. on – you know the type of thing? Yet Dancing is just as deep but quite poppy so it’s gone on one with the Beatles, CSN &Y, Tom Paxton and Commander Cody. Same singer, same songwriter, same album but poles apart in temperature. But it works. I was especially disappointed that Pretty Things wasn’t an ode to the 60’s rockers of the same name; but instead is an exquisitely dour pop song about being an outsider and proud of it. Perhaps it is about Phil May and the gang after all. The more I’ve played this album the more I’ve fallen in love with it. Songs like In My Dreams and Telephones certainly won’t appeal to everyone; but the music industry needs artistes like Mo Kenney as knowing pearls like this exist, makes sifting through the grit in the oyster of daytime radio bearable.